*Required to find available offers at your address. Residential Services and Rates vary per location. By entering your address, we'll be able to provide you with the most accurate information for your home. Get the best deal when you combine TV, Internet, and Voice with a Spectrum Triple Play. Get a great price when you bundle! More channels for a great value! The most channels for the best deal! There's nothing quite like watching TV in HD, especially if it's FREE! Spectrum TV® gives you the most FREE HD available anywhere. Watch your favorite shows or movies when you want with up to 30,000 On Demand titles and FREE Primetime On Demand. With the most powerful in-home WiFi available, Spectrum Internet® lets you stream, game and download across all your devices. Stuck in a contract? Don’t worry, we'll pay off your old provider's early termination fees up to $500◊ so you’ll never feel trapped again. 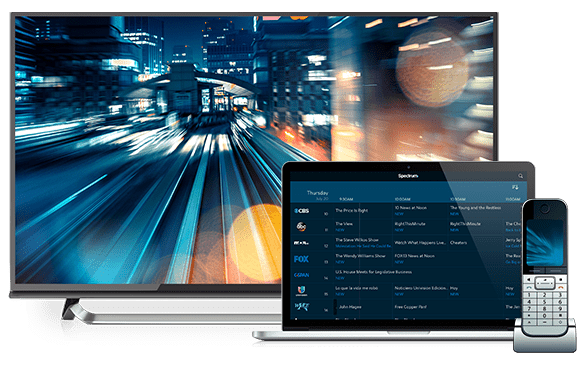 Enjoy your favorite entertainment from live shows to On Demand movies, anywhere in your home on your devices with the FREE Spectrum TV App. 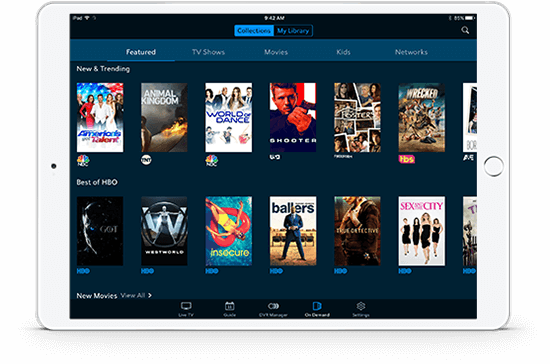 Plus, take your favorite sports, movies and shows on-the-go with access to over 80 channel apps available. * Limited time offer; subject to change; valid to qualified residential customers who have not subscribed to any services within the previous 30 days and who have no outstanding obligation to Charter. Standard rates apply after yr. 1. Price for TV Select, Internet and home phone is $99.97/mo for yr. 1; standard rates apply after yr 1. Installation, equipment, taxes, fees and surcharges extra; additional services are extra. General Terms: TV: TV equipment required, charges may apply. Channel and HD programming availability based on level of service. Account credentials may be required to stream some TV content online. INTERNET: Speeds based on wired connection. Available Internet speeds may vary by address. Home phone: Unlimited calling includes calls within the U.S., Canada, Mexico, Puerto Rico, Guam, the Virgin Islands and more. Services subject to all applicable service terms and conditions, subject to change. Services not available in all areas. Restrictions apply. Enter your address to determine availability. @ 2019 Charter Communications. All rights reserved.